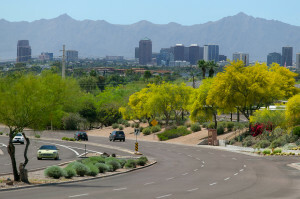 The revised version of an Arizona collision repairer lawsuit offers specific allegations of insurer steering and disregard for the views of plaintiffs while still DRP shops. 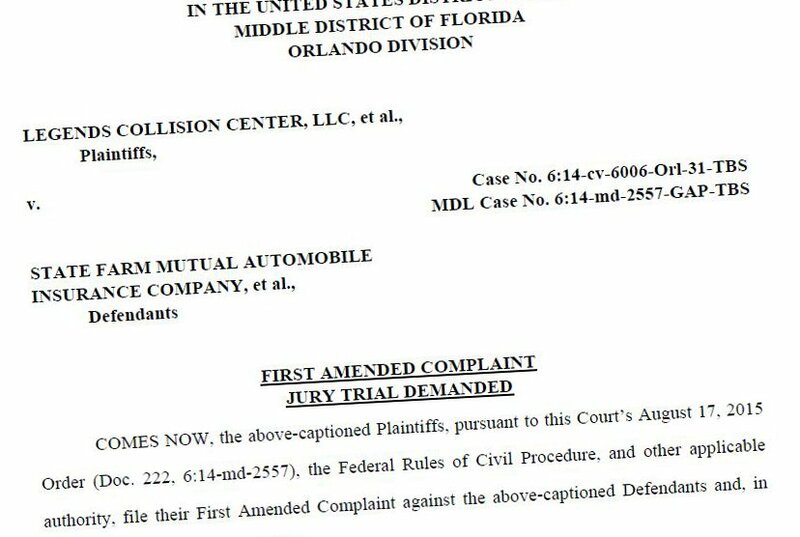 Unfortunately for the shops, the dismissal for good of the related A&E v. 21st Century case in Florida — structured almost identically to this one and using the same Mississippi law firm — might mean Arizona’s Legends Collision Center et al v. State Farm et al will suffer the same fate. That Sept. 24 ruling came five days after the Legends shops’ attorneys filed their new complaint. Shops alleged in the new Legends case that the alleged steering specifics cited “raise more than a reasonable probability” of all the defendants behaving like this, and discovery would prove as much. State Farm, Allstate and some of the other insurer defendants wrote in an Oct. 9 motion to dismiss the case that the alleged steering wasn’t actually illegal as conducted; failed to sway some customers anyway and thus didn’t break the law; and even if it did happen, those few isolated instances aren’t enough grounds to allege a boycott conspiracy. It’s also not enough to support a tortious interference lawsuit against individual insurers, they argue. “The conduct Plaintiffs allege in apparent support of their boycott claim includes a smattering of allegations that a few Defendants attempted to steer policyholders to non-plaintiff shops or told certain of their policyholders not to take their cars to certain body shops. There are no such new allegations of attempted steering as to 36 of the 42 Defendants. Moreover, even the few allegations of purported steering are highly specific and individualized. The addition of some isolated facts as to a few Defendants shines a spotlight on the truth that Plaintiffs have no basis for their broad allegations of a concerted refusal to deal. Plus, “steering is not equivalent to a refusal to deal and, accordingly, cannot support a boycott claim,” State Farm, Allstate, USAA, Encompass, Mercury and others not named in this article wrote. But if the defendants are correct in all of these assessments, shops and the public — including the insurers’ own customers — certainly don’t have to like delayed adjusters or steering attempts, even if all these practices follow the letter of the law. She also read negative online reviews about the DRP shop, asked the insurer about them, and was told the shop would be just as good as Legends. GEICO said the shop should be allowed to warranty their work, but after the driver found “the trunk, hood and back doors were not flush, there was paint missing from the tops of the doors, and there were multiple scratches that were left unrepaired … brought her vehicle to Legends for re-repair,” the suit states. The insurer wouldn’t OK Legends’ fees, and the battle dragged on for nearly eight months until GEICO called the vehicle a total loss and refused to pay all storage fees and rental charges, according to the lawsuit. The lawsuit also states Legends was “threatened” by Encompass and Mercury, both of which allegedly said they’d tell customers that the shop overcharges and the policyholder would have to pay the difference. GEICO didn’t respond to the specific allegations, though the State Farm motion says it did. Its motion to dismiss the first version of the Legends lawsuit cites its similarities to a version of the A&E lawsuit dismissed in January. Jan’s Spectrum featured in a few examples of prospective or past customers being convinced to use State Farm instead. After receiving a $2,600 estimate from Jan’s, a prospective customer insured by State Farm emailed the shop that he “’spoke with State Farm and it seems they need me to go to one of their shops,'” according to the lawsuit. Safeco allegedly tried a few tactics to unsuccesfully steer a longtime Jan’s customer away from the shop, saying “‘well [Jan’s Spectrum] like to charge more than what Safeco policies allow for labor/part,'” according to the case. GEICO might have millions for ad spending, but according to the lawsuit, it allegedly wouldn’t pony up to properly fix a brand new car. The insurer had towed a customer’s vehicle to a DRP shop, but the customer requested it be brought to Airport Auto because of negative reviews about the DRP shop. It was taken instead to another branch of the same DRP chain, the lawsuit alleges. That shop wrote an $8,500 estimate that included remanufacturing the composite wheels on the vehicle — which had only 37 miles — according to the lawsuit. Airport Auto saw a customer OK a $13,777.04 repair order, only to reverse and go to an Allstate DRP shop after an Allstate agent — who allegedly wouldn’t give his name to the shop — convinced them to do so. Besides collision repairers claiming to have been the victims of steering to DRP shops, the case offers alleged instances in which the insurer-DRP shop relationship wasn’t always harmonious. Jan’s Spectrum, a 20-year veteran of Farmers’ direct repair program, was allegedly barred from working on more expensive repairs following a dispute over a vehicle. “Among other things, the customer’s vehicle’s composite wheels were damaged and, in Jan’s Spectrum’s professional opinion, need to be replaced,” the lawsuit states. “Farmers Defendants’ agent disagreed. As a result of failing to comply with Farmers Defendants’ direction, Farmers Defendants stripped Jan’s Spectrum from being able to begin repairs on Farmer Defendants’ covered vehicles estimated at requiring under $4,500 worth of repairs until Farmer Defendants’ agent authorized the repair. The lawsuit also seems to imply that State Farm removed Airport Auto, another plaintiff, from its direct repair program after the latter refused a recycled part on safety grounds. Airport Auto felt it was “unfit for use—due principally to concerns of safety and crashworthiness,” the lawsuit states. The same shop also was allegedly warned by USAA that it wasn’t using enough aftermarket parts. It refused to alter its practices, and allegedly saw its volume of USAA vehicles drop. Airport Auto notes it ultimately left the DRP on its own because of factors like this and the requirement that USAA be added to its liability insurance. “Defendant insurers routinely specify Airport Auto to use aftermarket and salvaged parts when using such parts would void the vehicle manufacturer’s warranty, contradict the express direction of the vehicle owner, and/or contradict the vehicle manufacturer’s recommendation,” the lawsuit states. “To the contrary, these new allegations only underscore differences among the alleged reimbursement practices and parts replacement decisions of Defendants, rendering any alleged conspiracy or agreement implausible,” the State Farm motion states. Finally, the lawsuit alleges that insurers generally disregard the P-pages related to payment for feather, prime and block, repairing and refinishing pinch-welds, paying tint but not blend and clearcoating to the edge of a panel. return a vehicle to its pre-accident condition,” the lawsuit states. But other insurers, including Farmers, Progressive and Safeco, noted in a separate motion to dismiss that the court’s already held that there’s no reason why the insurers need to adhere exactly to the estimating databases (even though they certainly like to hold shops to them) and the varying actions of some defendants can’t be used to present group actions. They also cite the court’s distaste for allegations against a collective group of defendants. Cleaning House Insurance Janitorial | This is my Site.